Jakarta - One of the largest automotive exhibition held by PT Dyandra Promosindo, Indonesia International Motor Show (IIMS) 2018 has attracted many automotive lovers in Indonesia. The exhibition which held for 11 days starting from 19 to 29 April 2018 at JIExpo Kemayoran, Jakarta, brings the theme "Your Infinite Automotive Experience". 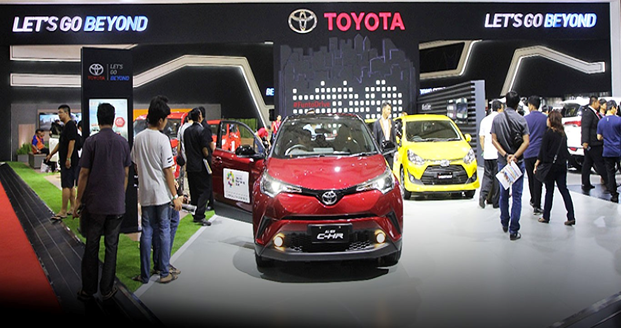 Toyota Indonesia is on Hall D1A brings the theme "Small But Beautiful". On this occasion, Toyota Indonesia showed 13 units of vehicles including four new products of Toyota which are All New Rush, New Yaris, New Vios, and compact crossover-latest SUV Toyota, All New CHR, which was officially promoted in Indonesia on April 10, 2018 Toyota C-HR in Indonesia has a 1.8L 2ZR-FBE engine with Dual VVT-i technology with 7 speed CVT sequential shiftmatic transmission equipped with 7 SRS airbags. In addition, Toyota C-HR also has a Blind Spot Monitor System. This feature made to warn the driver with an indicator that lights up in the car's rearview mirror if there are other objects around the car that are not seen by the driver (blind spot). In Indonesia International Motor Show (IIMS) 2018, Toyota has prepared a 900m2 booth which is divided into 4 zones which are, Family Zone where there are four line-up of family dream vehicles such as Sienta, Innova, Avanza, and Calya. Fun To Drive Zone filled by Agya, Vios, Yaris, and CHR. While for the Adventure Zone is filled by two line-up of sport utility vehicle (SUV) that is Toyota Rush and Toyota Fortuner. Otherwise, for the Premium Zone represented by Toyota Alphard and Voxy. In order to celebrate the welcoming of Ramadan, at this time IIMS Toyota Indonesia held a THR program or Toyota Ramadan Prize. In this program, customers have the opportunity to get a total prize of 3 units of New Alphard, 30 units of All New Calya, and 300 units of motorcycle for customers who purchase cars at Toyota dealers such as Calya, Agya, Avanza, Yaris, Sienta, Kijang Innova and Fortuner in the terms of April-June 2018, including those who make purchases at IIMS 2018. The lucky draw will be pick up 3 times or every month. Which each lucky draw period will have 1 winner. Besides that, IIMS 2018 bring back a test drive area that to be visited. Toyota Indonesia provides 2 units of its newest car, the Toyota All New Rush and New Yaris, so that customers can feel the direct sensation of driving the Toyota All New Rush and New Yaris.